with the utmost respect and gentility. So get your tread on, explore and tread lightly! For almost a year, I have been visiting the Harley Davidson store picking up their old motorcycle tires. They know me now and even call me when they get a unique “tread” in. 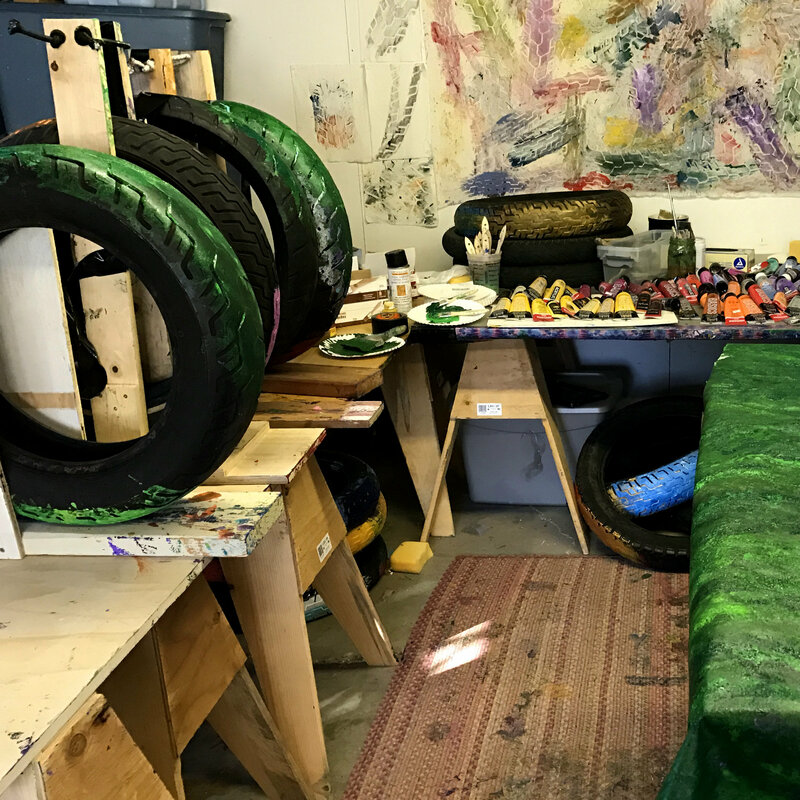 Every single used tire tells an adventurous story from the road and I love transferring that story to the canvas, designs and products that are created for Treads On Threads. It is with great pride that I announce the official launch of TOT online store. I’m excited to share our growing inventory of products and designs with you along the way. 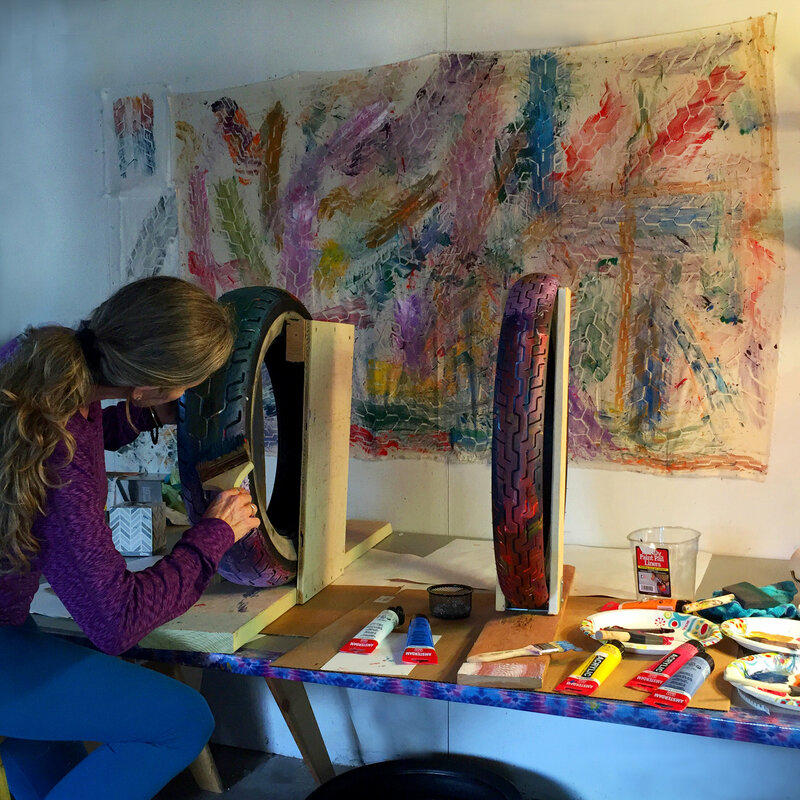 The design in the photo above, Wildflower Leggings was created with used motorcycle tires. The concept was drawn from artist, Robbie Kaye’s early motorcycling experiences that continue to inspire her life of treading – whether by motorcycle, train, plane or automobile. Treads on Threads allows others to celebrate their own life journey with easy-travel, made-in-the-USA, inspired pieces: tee-shirts, hoodies, leggings, and products for wee-ones, that benefit great causes, including Art Outreach Organizations. Keep an eye out and in the meantime, please use the code tot10 for our debut discount and enjoy perusing the website. We LOVE photos of people in their treads so please send us some! We’ll be sharing them on the Treads on Threads website. Be Strong, Be Brave and Tread Gently.